Whether your offices are open plan, traditional or purpose built, we have a customised cleaning solution to meet your exact requirements. We consistently provide a high standard service to suit every budget. We know that working in a clean and healthy environment leads to productive employees. We seamlessly work with every client to exceed your standards whilst always keeping an eye on the bottom line. We pride ourselves on being innovative in office cleaning. Traditionally, office cleaning is done in the evening, but we recognise that this arrangement is not ideal for every location. Whether it’s the latest, low wattage, low noise vacuum cleaners, overnight cleaning or centralised waste and recycling points, we offer ways to clean that supports your core business. We carefully balance input hours and standards to suit every budget; so that every company can benefit from our innovative approach. Our close relationships with suppliers ensure we always have access to the latest advances in machinery and environmentally friendly products. 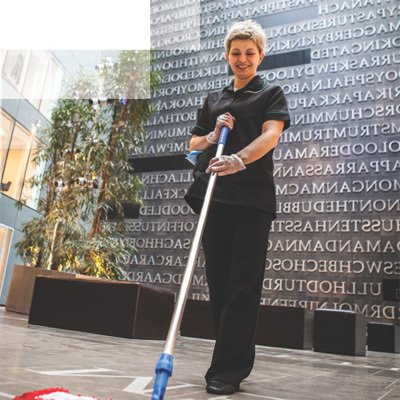 Our staff of 2,500 are managed effectively to deliver to you the most efficient cleaning service for your needs and budget.